Born in 1956 into a family of distinguished musicians, Nigel Kennedy started out his remarkable career in music as a boy prodigy (he became a pupil at the Yehudi Menuhin School of Music at the age of 7), and soon developed a highly individual style along with an unconventional approach that made him one of the truly unique -and controversial- violinists of his generation. While still 16 years old, Kennedy was invited by legendary jazz violinist Stéphane Grappelli to play with him at Carnegie Hall in New York (which he did, successfully, against the advice of his classical teachers). His debut record featured Elgar’s Violin Concerto, while his 1989 recording of Vivaldi’s The Four Seasons with the English Chamber Orchestra became one of the best-selling classical recordings in history, with total sales of over three million units. Over the last decades, Kennedy has made a name as one of classical music’s most (in)famous mavericks, regularly crossing over different music genres while developing his signature, unorthodox performing style and idiosyncratic playing. His tastes and influences vary from baroque and classical to jazz and rock (he has recorded an album with improvisational covers of Jimi Hendrix), and next to many of the world’s leading orchestras he has also collaborated with musicians such as Paul McCartney, Kate Bush, Robert Plant and The Who. It was Kennedy’s acquaintance and apprenticeship with Grappelli that led him to a deeper appreciation and understanding of Gershwin’s music, which features in his latest album Kennedy Meets Gershwin. Kennedy’s first live appearance in Greece took place earlier this week at the ancient Odeon of Herodes Atticus stone theater in Athens. Together with his ensemble (Peter Adams – cello, Yaron Stavi – double bass, Rolf Bussalb – electric guitar, Howard Alden – guitar), the English violinist performed a varied program in front of a warm and enthusiastic crowd. After opening the concert with an original and absolutely breathtaking interpretation of Bach’s fugue from the first violin sonata in G minor, the highly energetic Kennedy carried on with some recent works by “one of his favorite composers” (i.e. himself), before moving on to a selection from his new album featuring his refreshing and lively arrangements of Gershwin’s classics Rhapsody in Blue and Porgy & Bess. Kennedy’s seemingly inexhaustible energy and high spirits led to a prolonged (nearly 3-hour-long) concert full of pleasant musical surprises, including Kennedy’s piano playing and an absolutely thrilling performance of the popular Csárdás, showcasing his astonishing virtuosity, improvisational skills, and… sense of humor (there were several moments when his comments caused loud laughter across the theater). Kennedy’s sensational performance closed with an electrifying rendition of Minor Swing by Django Reinhardt and Stéphane Grappelli – indeed, a perfect ending to the evening and a testament to the musician’s ability to roam seamlessly through baroque, classical, gypsy, klezmer, and jazz music. This entry was posted in Concerts and tagged Athens, Bach, classical, Django Reinhardt, Gershwin, Grappelli, Greece, jazz, live, Nigel Kennedy, violin, Vivaldi on July 19, 2018 by The Muser. It all started in 2003 in Barcelona with the first version of In-Edit festival, when the once neglected genre of music documentary came to the fore. Ever since, a steady increase in interest from audiences worldwide has ensured a great selection of music docs are screened each year from Chile and Colombia to Germany, Spain and Greece. As I find myself sitting through various screenings during the first chilly and cloudy November days in the Greek capital, here’s my picks from this year’s Athens edition. A moving and heart-warming documentary about American soul singer Charles Bradley (1948 – 2017), who sadly passed away in Brooklyn earlier this year. Tracking the events that led up to the release of his debut album No Time for Dreaming, the film follows Bradley’s remarkable life story through his early childhood in Florida and Brooklyn, his years as James Brown impersonator in California, and finally his return to New York and his recording with Daptone Records. Through a series of endless hardships and constant struggles, there emerges a portrait of a man who, against all odds, managed to realize his biggest dream, releasing his first and widely successful album at the age of 62! Not unlike the excellent Searching for Sugar Man, which also relates an inspirational story of an unlikely revival, the film is ultimately about the unwillingness to compromise and the triumph of will in the face of adversity. A key figure in the history of jazz, American pianist and composer Bill Evans (1929 – 1980) was one of the most influential jazz musicians to emerge in the second half of the 20th century. This documentary portrays Evans both as musician and person, following chronologically his life through his childhood in New Jersey, his musical development and collaborations (most notably with legendary trumpeter Miles Davis), to his drug addiction and untimely death at the age of 51. Highlighting Evan’s musical genius while also showing his darker, less attractive side, the film (which took producer Bruce Spiegel 8 years to make) provides valuable insights into the music and -often troubled- life of Bill Evans, while offering a comprehensive overview of his career by bringing together the testimonies of various ex-collaborators of Evans, such as Tony Bennett, Jack DeJohnette, and Paul Motian. If there ever was an epicenter of alternative culture throughout the turbulent 1980s, it must have been the western half of the -still divided by then- city of Berlin. The film takes us through a fascinating tour of West Berlin’s alternative music scene through the eyes of musician and producer Mark Reeder, who traveled from Manchester to Berlin as a teenager in order to get a first-hand experience of the city’s vibe. Featuring rare footage from the city’s underground hubs as well as clips, interviews and performances by key artists that lived and worked in Berlin around that time (such as Einstürzende Neubauten, Die Toten Hosen, Die Ärzte, Nena, and Nick Cave), the film gives us a good idea of what it was like to be living and creating in 1980s West Berlin, while also providing the soundtrack for one of Europe’s most vibrant cultural scenes during the Cold War era. This entry was posted in Film & Music and tagged 1980s, Berlin, Bill Evans, Charles Bradley, Die Ärzte, Die Toten Hosen, Einstürzende Neubauten, festival, Film, Germany, jazz, Mark Reeder, music, Nena, New York, Nick Cave, soul on November 7, 2017 by The Muser. I recently came across the very interesting book “X-Ray Audio” – The Strange Story of Soviet Music on the Bone by Stephen Coates. Focusing on the underground culture of Roentgenizdat, also known as “music on ribs” or “jazz on bones”, it tells the fascinating story of bootleg and pirated X-ray music discs that were circulated illegally in Soviet Russia during the immediate post-war era through the 1960s. Made from medical X-rays that were subsequently cut into 7-inch discs with the aid of special machines, these discs featured music by officially censored artists such as the “King of Russian Tango” Pyotr Leshchenko or Western jazz and rock’n’roll musicians like Bill Haley, Ella Fitzgerald, and The Beatles. A sort of musical parallel to the samizdat (the underground publication and distribution of dissident literature), the history of these Soviet bone discs is truly incredible as well as illuminating: it reveals how far people were willing to go in order to obtain, enjoy and share the forbidden fruit of inaccessible music. The risks involved were serious: Sound engineer Ruslan Bogoslovsky (1928-2005), a true hero of Soviet underground record production, was sent to prison camps no less than three times throughout his life for cutting Western music onto records that originally contained speeches of Soviet leaders. In his book Back in the USSR: The True Story of Rock in Russia (first published in 1987, shortly before the collapse of the Soviet Union), Troitsky provides a compelling account of the evolution of the Soviet rock scene since its birth in the 1960s. An insider, Troitsky offers an abundance of first-hand information and anecdotes related to the foremost Soviet rock musicians and groups that are little, if at all, known in the West, such as Time Machine (the “Russian Beatles”) and their founder Andrey Makarevich, Aquarium and their leader Boris Grebenshchikov, guitarist Alexander Lyapin (“closer to Hendrix than any other Soviet rock guitarist”), or the iconic post-punk band Kino and their singer Viktor Tsoi. Starting with the crucial influence of The Beatles on the genesis of Soviet rock, Troitsky goes on to describe key events, places and moments of its history, such as the hippie gatherings in Tallin and Crimea (“something of a Soviet California”), the Leningrad and Moscow scenes, the “intense though fairly isolated” rock culture of Estonia, the 1980 Tbilisi festival, the emergence of home-made albums in the early 1980s, and the “Account 904” concert (organized in 1986 by Troitsky and others to raise funds for the victims of the Chernobyl disaster). Apart from its purely historical value, Troitsky’s account also offers some stimulating remarks on the nature of Russian culture and its differences from the West. For example, he writes: “[T]he purely literary level of our rock lyrics is higher, on the average, than in the West. Rock lyrics here have a direct tie to our poetic tradition and reflect its lexical and stylistic heritage.” I find this assertion particularly interesting in the light of the recent Nobel award to Bob Dylan and the related discussion on the relationship between music and literature. This entry was posted in Books, Film & Music and tagged Alexander Lyapin, Andrey Makarevich, Aquarium, Artemy Troitsky, Beatles, bone discs, Boris Grebenshchikov, censorship, jazz, Kino, Pyotr Leshchenko, rock, Roentgenizdat, Russia, samizdat, Soviet, Stephen Coates, Time Machine, Viktor Tsoi, X-ray audio on January 21, 2017 by The Muser. It is common to associate certain songs, albums or artists with the occasion and the place where we first listened to them. This is especially true when the first hearing is linked to a place of exceptional beauty, which stays forever intertwined with the tune/artist in question. I have such a memory from some distant summer holidays in the small island of Elafonisos, just off the Southern coast of Peloponnese in Greece. Known for its sandy beaches and blue-green waters, Elafonisos is an ideal place to wind down and tune in your body and soul with the beautiful, serene scenery. Every day we would walk up to a small beach bar for a snack, casual talk and enjoy the splendid surroundings. To top it all off, there was almost always some intriguing music coming from the bar’s speakers that seemed to blend perfectly with the surrounding space. One time, while I was enjoying the most delicious karydópita (pecan pie) with fresh vanilla ice cream I have ever tasted, I decided to walk up and ask the bartender/cook/DJ what was the tune we were listening to. I could tell it was some sort of jazz adaptation of Vivaldi, but I had never heard something like it before. He wrote down the name of the artist on a piece of paper and handed over to me (back then there was no mobile phones, let alone Wi-Fi). The note read “Jacques Loussier”. That’s how I was introduced to the wonderful world of the Jacques Loussier Trio and their magnificent renditions of classical music (from Bach and Vivaldi to Chopin and Debussy). To this day, when I listen to Vivaldi’s ‘Four Seasons’ played by Loussier’s jazzy piano trio, my mind flies instantly toward the Greek summer – the most beautiful season of all. This entry was posted in Various and tagged Elafonisos, Greece, Jacque Loussier, jazz, piano, summer, Vivaldi on June 23, 2015 by The Muser. I first listened to it some years ago, not exactly sure when or where anymore. But I fell in love with it instantly, from the first hearing. I knew immediately that this was a record I could listen to again and again, without ever getting tired of it. And so it happened. To this day, Keith Jarrett’s The Köln Concert remains one my favorite albums; not just as far as jazz is concerned, but from any music genre. What I didn’t know until recently is the fascinating story behind the making of this remarkable record. Jarrett had originally requested a Bösendorfer 290 Imperial concert grand piano for his performance at Cologne’s Opera House. However, when he arrived at the venue (tired from not sleeping well in several nights and in pain from back problems), he was in for a surprise: due to some confusion by the opera house staff a different, much smaller baby grand piano was waiting for him instead. Although the instrument was in quite poor condition (thin in the upper registers, weak in the bass register, the pedals not working properly), Jarrett eventually decided to go on with the concert. And in spite -or rather, because- of the adverse circumstances, he delivered an inspiring performance that later went on to become the best selling piano album of all times. I think the way Jarrett managed to create something so beautiful under such unlikely circumstances can be seen as a valuable lesson – not just for pianists, jazz musicians or improvisers but for all of us. No matter how hard or unfavorable the conditions, one can always manage to make the best out of a situation. And, furthermore, even excel exactly because of the obstacles presented to him or her. This entry was posted in Various and tagged Cologne, jazz, Keith Jarrett, music, piano, The Köln Concert on February 19, 2015 by The Muser. Written in 1937 by Richard Rodgers and Lorenz Hart, My Funny Valentine would go on to become a popular jazz standard, appearing on more than 1300(!) albums in total and performed by such great artists as Frank Sinatra, Ella Fitzgerald and Miles Davis. One of its earliest and most memorable recordings was by the Gerry Mulligan Quartet in 1952, which featured a captivating solo by Chet Baker. It was a major hit, and became a tune closely associated with Baker until the end of his turbulent life. A life that came to an abrupt end on on May 13, 1988, when the American trumpeter, flugelhornist and vocalist was found dead on Prins Hendrikkade, the street below his room at Hotel Prins Hendrik in Amsterdam (nearby the city’s Central Station). An autopsy found heroin and cocaine in his body and these drugs were also found in his hotel room. His death was ruled an accident. I also happened to live on Prins Hendrikkade for one year when I first came to study in the Dutch capital, oblivious of the grim connection between the street and Baker’s death. Ever since I found out about it, memories of my student days mingle with Baker’s melodies as I pass by the area around Hotel Prins Hendrik. 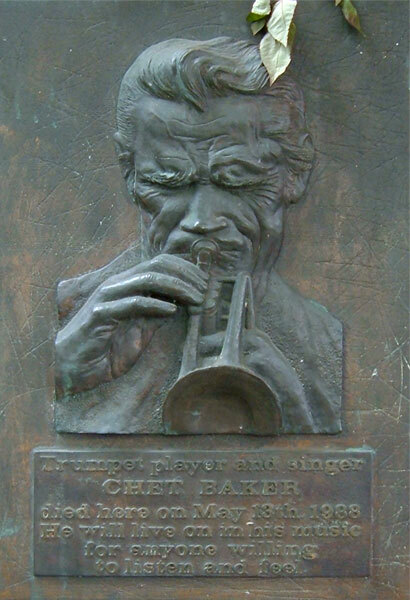 This entry was posted in Various and tagged Amsterdam, Chet Baker, jazz, music, Valentine on February 14, 2013 by The Muser.